Please join to PAMM platform for free now. Please include attribution to Hotforex PAMM with this graphic. Speaking of pooled investments, our subject matter in this article is a Percentage Allocation Management Module (PAMM) account. What is it? A PAMM account involves the allocation of funds, by a client (investor) to another client (trader) who uses the same broker. This means two clients of a single brokerage firm here, like Hotforex PAMM, meet with the other one (trader) helping another (investor) to invest his or her own money. Investing clients could be in their numbers but making use of a single trader. All this dealing is done using PAMM technology. Funds allocated to a PAMM account are each allocated a percentage share, which will be the size of funds from each investor within a single account. This is such that of the total fund, investors could own 25%; 35%; 20%; with the owner (trader) owning the remaining 20%. Therefore, 3 parts are involved here: A broker firm which owns the trading platform; The trader, or account manager responsible for allocating funds to trading products which is foreign exchange or forex in the case of PAMM; The investor who allocates his or her money to a trader with the hope of making profits from the activities of the trader. Traders in a PAMM account are called fund managers or masters and investors are called followers because they follow exactly their master’s trading strategy, or portfolio allocation. The master has limited power of attorney and can act, to a certain degree, on behalf of his or her followers. A trader or master can simultaneously manage an unlimited number of followers’ accounts. Worth to note is the fact that the trader in this case also has his/her own money in the instrument being traded and also remains a client to the broker firm. 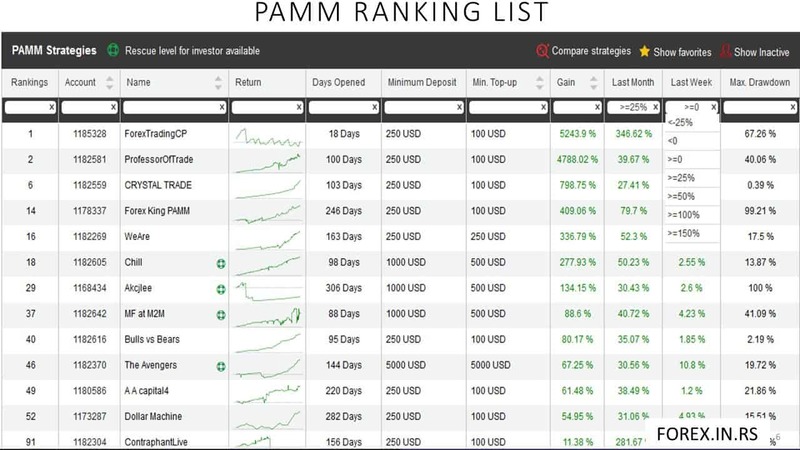 How to choose PAMM fund manager ? Forex market attracts its clients because it seems to be an easy market to get a portion of $5.3 trillion daily deals with high returns and big volume as well as market’s volatility. But, as you guess from the “it seems” part, getting money in this market is not a safest bet for many traders. If it were just a place to collect your invested returns, it probably would be there. A large portion of that money comes from quick thinkers, and it goes to smart thinkers. To get the best of the Forex market, you will need to learn as much as possible about the market, its basics of the technical aspect of it. However, to get a grip over it, you’ll need to have a good fundament in financials. If you don’t, then find somebody who does. If you don’t have a financial background, you might want to think about PAMM investing. PAMM investing is having your money entrusted to a manager who can safely deal with it as if it’s their own. And in a way, it is theirs to operate on the basis of profit/loss. With PAMM investing there is software that distributes the profits and losses automatically. Here are some tips on how to wisely choose your PAMM manager. One of the first things to consider is the manager’s experience. It’s the same thing with hiring any sort of help you want to get somebody who has experience. For this sort of help, you want to check the period an account managed by that certain fund manager. You want to see an account that has been around for at least three or four years. Only then you should check out the rest of the accounts results. The consistency in performance is what gives away a trader with experience. After the experienced is checked and passed, you want to see how it went with live trades. If you see that your broker isn’t offering valuable information, you can ask your fund manager to show those results, for example, on myfxbook. You will there see what’s the drawdown like, as it give you a hint about the size of the risk. If you see high risk in drawdown, we suggest you avoid those. When that’s passed, you can check how consistent your fund manager is with a certain result. The consistency is better than having big profits with the lack of consistency, as that shows more luck and less strategy. Next thing to check is the capability of the fund manager to recover. Recovery factor represents the quickness the trader can recover from suffering drawdown. Obviously, what you want form you manager is to have a great recovery factor, as it represents their reliability. The recovery passed, check how much investors have their accounts managed by your fund manager. That’s another safe thing upon which you can know if your fund manager is reliable. If several investors trust that particular fund manager, that’s a good reference. If there is a chance, you’ll want to see how good your fund manager is with all those clients. Total equity is something to check out also for choosing your fund manager. The safest bet is to find somebody who trades at accounts of medium sizes. The reason for that is when a fund manager has a lot of capital to operate with; they might deal with risky trades. You never know what they would do with the amount of funds you have. Therefore, try to find somebody who deals with the similar account you have. How you pay your fund manager? Since a fund manager is basically a trader, but who trades with your money, he can only get a portion of the return you two get. Fund managers who are successful trader, you can expect that they would ask larger remuneration. However, if your fund manager does have a proven track, don’t bother to negotiate too much about his or her commission. But, you can always make sure to make a good deal and discuss all the terms with the broker before investing your capital. The first advantage that PAMM technology brings on the table is the fact that bigger pooled funds make more profits than smaller invested portions. This is so, especially in forex trading, because trading in foreign exchange has very small profit margins which only make sense when the amount of invested money is higher. Individuals might find it difficult to raise those kinds of money, hence the need to pool funds together. The other advantage is that of taking advantage of an expert trader’s skills to make profits. Investing, especially in forex is not a piece of cake and many investors lose out on all their money on their first try. Therefore, PAMM technology enables amateur traders the opportunity to piggy-back on expert traders’ experience and make money whilst sleeping. More so, making use of this technology allows investors to make money on the back of almost zero administrative hassles. This is so because all the investor has to do is allocate a portion of funds to the trader’s account and wait for reporting from the trader. The trader is the one who does all the work and will make sure that everything ticks boxes regarding the fund. 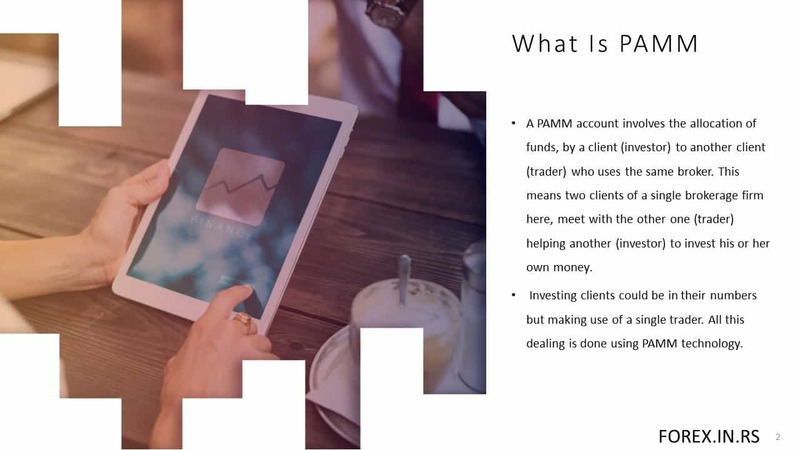 Another advantage of using a PAMM account is that it is extremely safe to follow since the involved trader will also be having his or her own funds in the account. This provides the need for the same trader to exercise caution with investors’ money since any amount of losses will also hit his or her money hard. 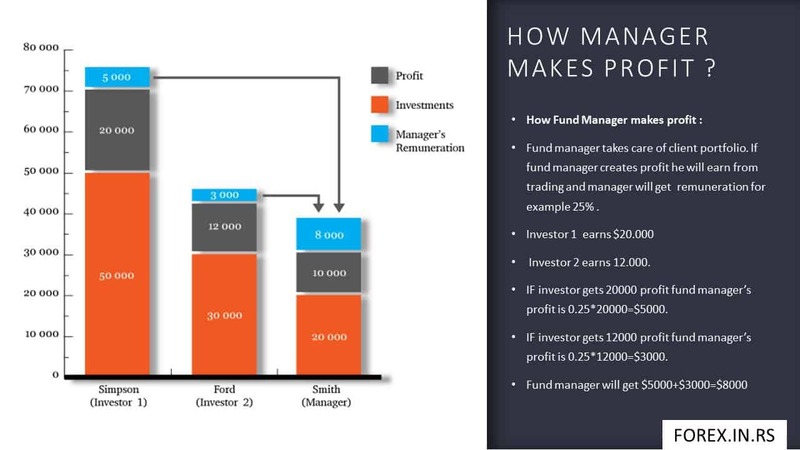 Lastly, in a PAMM account, you get profits that are equivalent to your percentage ownership of the fund. This means that you can control how much you make by investing a little more than the rest. An example is when the fund makes $100 000 in profits, the investor who owns 70% of the fund will be guaranteed of $70 000 in earnings. Are there any disadvantages for using a PAMM account? Just like any other thing about life, a PAMM account has got to have its own weaknesses. But hold on; don’t start panicking because it can’t be that serious. Using a PAMM account could only hurt an investor in the case that the same investor owns the biggest portion of the fund, say 55%, and the fund goes on and makes a huge loss. Remember that you get, or lose what is equivalent to your percentage ownership of the fund. But you cannot be worrying too much about this since the masters in a PAMM account are largely experienced traders with a proven record. PAMM accounts technology is a welcome invention in the world of forex trading. From what we have learnt so far, we realize that in trading, there are the traders who understand trends better than others. These have a higher probability of getting it right with their portfolio allocation, or taking positions (Buy or Sell). Therefore, PAMM technology allows for those who are less-understanding of the trends the opportunity to profit using the experts’ knowledge. Using this technology is done through a regulated Broker Firm; hence it is safe and can be trusted as have been proved. There is no any other safest way of making profits through bringing together an experienced trader and other investors together through a central brokerage system.